Christopher Bucklow was born in Manchester, England in 1957. His works are in collections including the Museum of Modern Art in New York, the Metropolitan Museum of Art, the Victoria & Albert Museum, and SF MoMA. Bucklow is best known for his luminous silhouette photographs, works that place him within a movement building since the early 1990's of British photographers who have taken the art of the photogram into ever more novel, interesting, technically and conceptually challenging territory. Bucklow’s second show at Danziger Gallery combines 17 new photographic works – both figurative and abstract –with a sampling of the paintings that have engaged Bucklow increasingly over the last decade. Probing deeper into his own subconscious, Bucklow’s otherworldly figures shift to canvas in darker and more primal narratives, opening up Guston-like to visionary dreams and nightmares. Bucklow’s newest photographs expand his repertoire to include interacting figures, a mysterious playing card like male/female reflection, and a separate suite of color abstractions influenced equally by Islamic pattern and quantum physics. 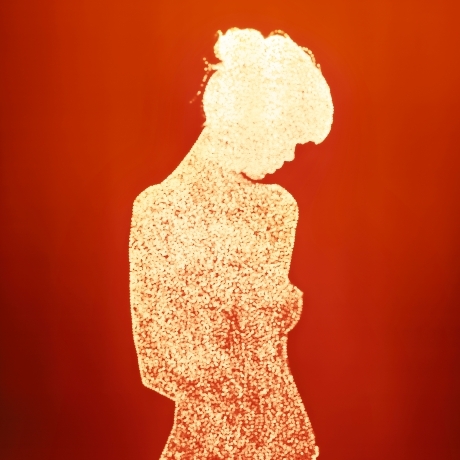 Bucklow’s photograms begin with his making of thousands of small pinholes on a foil silhouette. Using a contraption of his own device that places the foil over a large sheet of photographic paper, Bucklow wheels his homemade "camera" out into daylight and pulls the "shutter" to briefly expose the paper to direct sunlight. Thus each finished picture becomes a kind of photogram silhouette composed of thousands of pinhole photographs of the sun. The intensity of light on a given day and the length of exposure create unique color variations on how the resulting piece appears. Seeking to close the perceived gap between the thing and its depiction and searching for immediacy and tactility not inherent in traditional photography, Bucklow has found a way to avoid the delay between the release of the shutter and the production of the print. At the same time, his explorations into avoiding the negative are both literal and figurative, connecting light and art with the artist’s spiritual and aesthetic concerns.